Chocolate Bunnies [J1251] - $8.00 : Yarn Tree, Your wholesale source for cross stitch supplies. 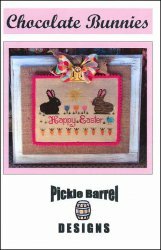 Cross stitch pattern by Pickle Barrel Designs. Look at these adorable bunnies! Easter has arrived! The sun is shining, the tulips are blooming & the carrots are growing! Happy Easter! Stitch count is 108 x 74.